One of the Historical Landmarks for Los Angeles is the L.A 6th. Street Bridge. And as we are all learning more about the sad news; the city is going to demolish and rebuilt the 6th Street Bridge because it is said that is actually falling! We are loosing yet another landmark that many of us can relate within our own personal lives as it holds many stories of tribulations, great times and most importantly the urban scenery connected to the L.A River. Our fellow artists want to bring awareness to the community on this topic by uniting and exhibiting a tribute to the 6th Street Bridge tomorrow night! I got to hang out at their venue tonight and got a sneak peek of some of the amazing and truly awesome art of some of the artists that are part of the exhibit. And I must say that although all of these artists come from very different backgrounds; their unique styles under one bridge will not only leave you nostalgic for the fact that this bridge will soon be gone, but it will also give you the opportunity to experience a piece of history from various points of views. 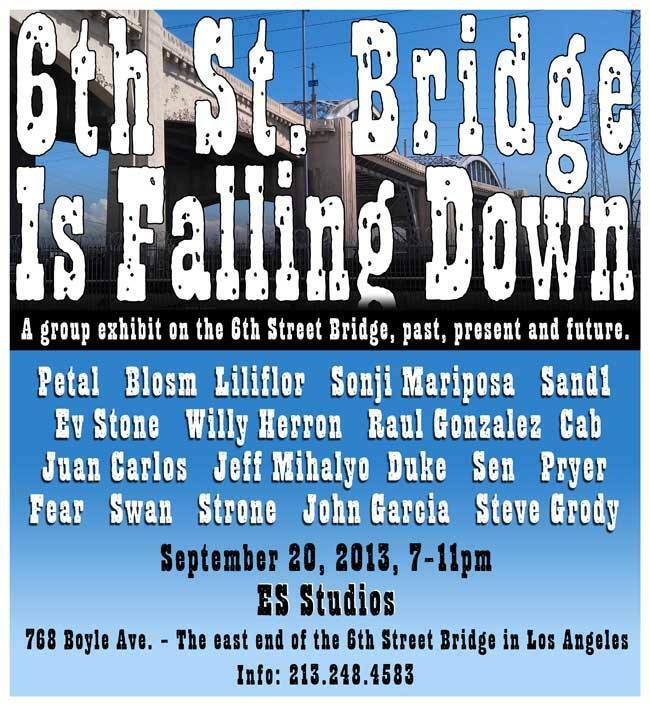 Make sure you come and support this historical art exhibit as many will share in their unique and creative interpretation of what the 6th Street Bridge means to them. You can find out more about this project by clicking on the link below; which will direct you to the Official Blog for the 6th. Street Bridge. 6th Street Peoples Park Bridge.